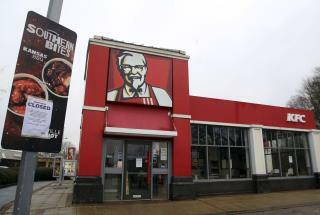 (Newser) – The chicken has crossed the road, "just not to our restaurants," explains KFC UK in a tweet addressing its weird problem: no chicken. USA Today reports about 900 of the chain's roughly 21,500 locations are in the UK, and only 300 of them were open Monday morning due a chicken supply issue. Per the tweet, the hiccup is on the delivery end, with the chain explaining it has "brought a new delivery partner onboard, but they've had a couple of teething problems." Somehow this story does not ring totally accurate. A sudden mass store closure with no advance knowledge of pending disaster. ? Hard to believe from a company that size. My sense is that we will now be forced to relive some deadly new bird virus threatening the US poultry industry. Mass bird die offs, and perhaps poultry recalls from the supermarkets. The CDC will then step in and instill both fear and calming for the public, while they control what they have created. Suffer? It's the poor chickens that suffer. Tyson bit off the ears of all of the chickens destined for KFC!